Pope Francis is creating a commission to investigate the possibility of women becoming deacons in the Catholic Church. The announcement came as Pope Francis addressed 900 world leaders of the Catholic women religious. The crowd asked the pontiff if the Catholic Church would consider female deacons. Roman Catholicism has historically kept an all-male clergy. “I believe yes. It would do good for the church to clarify this point. I am in agreement. I will speak to do something like this,” Pope Francis said, according to the National Catholic Reporter. He has previously said that women would not be allowed to enter the priesthood. 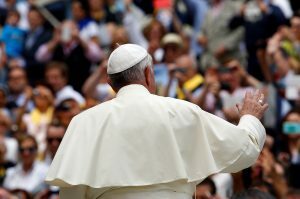 Ordaining female members as deacons would be a major shift for the Catholic Church, Joshua McElwee, Vatican correspondent at the National Catholic Reporter, told NewsHour. Francis said that it is a “theological/liturgical” issue of whether women can give the homily at Mass. He said there is “no problem” for women to give reflections or homilies at prayer services, but that during the Mass the priest is serving “in persona Christi” and is therefore the person to give the homily. The audience pressed the Pope, according to McElwee’s report, noting that women served as deaconesses in the early Catholic Church. That statement is true to some extent, said Chad Pecknold, professor of theology at Catholic University of America in Washington D.C. The Roman Catholic holy orders — or the offices of deacon, priest and bishop — are sacraments meant only for men, according to theology. The motivation for this idea, Pecknold said, comes from the first days of the Catholic Church when Jesus decided his apostles would be men. There are two kinds of deacons in the Catholic Church. Permanent deacons are married, help run the church and can assist the priest with preaching. Transitional deacons are priests in training.